Diamond Head, the New Wave of British Heavy Metal legends will be embarking on a European Tour this October – November 2018. Following the release of their self-titled new studio album in 2016 the band supported this release with extensive touring of the US, Canada, UK and EU which included festivals like Bang Your Head, Sweden Rock, Stormcrusher, Pyscho- Las Vegas, Leyendes Del Rock, Hard Rock Hell plus shows supporting Saxon. They have spent much of 2017 writing and preparing material for their next album to be released later this year. Diamond Head were a major influence on bands like Metallica and Megadeth with Metallica covering four Diamond Head songs including the classic Am I Evil? Plus Helpless, The Prince and Its Electric. With a 40 year career and seven studio albums the band is still going strong and continuing to be creative. 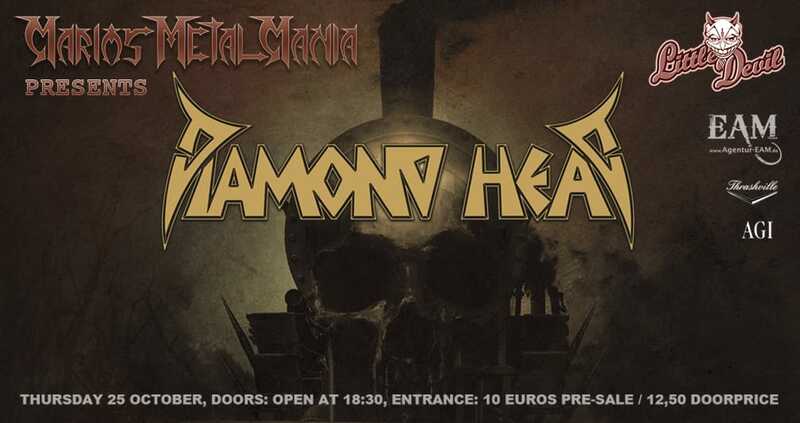 This upcoming EU Tour will see Diamond Head performing in 8 countries and 22 cities across central and southern Europe. FIRST SHOW OF THE TOUR IS NEVERTHELESS @ LITTLE DEVIL!!!!!!! Gin Annie are a hard rock band based in The Black Country. Formed in 2013, by Cousins David Foster (Lead Vocals) and Byron Garbett (Lead Guitar) with Andy Wi…liams (Bass), Toni Longhi (Guitar) and James Woodcock (Drums), Gin Annie quickly established themselves on the local rock scene with energetic performances of hard hitting versions of classic rock anthems. Due to demand, Gin Annie has played, on average, 50 – 60 shows per year since formation. An ever growing fan base of loyal “Ginners” allowed the band to attract headline shows at higher capacity venues such as Bilston’s Robin 2 (700) and Stourbridge’s The River Rooms (350) as well as supporting some extremely popular, world touring tribute acts like Back ‘n’ Black, Limehouse Lizzy and Bon Giovi International. In early 2016, James left the band and Gin Annie was brought to the attention of drummer Jack Ryland-Smith whose previous band, The Black Cats, had recently disbanded. Jack was an instant hit with Gin Annie and its fan base and helped further develop Gin Annie’s sound and performance. David and Byron then took their affinity for hard rock and started to write original material to give the Gin Annie audience something fresh that still had roots in the genre that its fans craved for week in and week out… Classic Rock: Music that was hard hitting, catchy and complicated in its simplicity. In August 2016 the band started to work with local legendary studio, Sanctuary, and recorded the first batch of new original material. The reception for this original material was overwhelming, with over 200 people turning up just to watch the first showing of the band’s music video, Damage Is Done. Within 7 days, the video had been viewed 35,000 times on Facebook alone – subsequent local shows are now even busier than before and some smaller venues are experiencing difficulty in coping with capacity. In light of how its music has been received, Gin Annie signed a management deal with Sanctuary Music Ltd and are now under the guidance of the respected and experienced Pete Newton. Gin Annie are now finishing up what will be their first official EP release and arranging a 5 city tour for spring 2017 as well as attracting attention from larger acts as support and popular festivals. Watch this space… Gin Annie will be your New Bad Habit. Experienced musicians from the Danish metal scene join forces. Get ready for heavy guitar-riffing in the classical spirit! The story of STATEMENT started in 2011, when Niels Alex – drummer of now departed Danish prime metal act Pilgrimz – met up with longtime friend and vocalist Jannick Brochdorf. Niels Alex was already an experienced musician on the Danish metal scene and has been playing in bands since 1994. With Pilgrimz he has been playing shows alongside bands like Motörhead, Gojira, Carcass, The Haunted and Volbeat, and festivals like Roskilde, Sweden Rock and Metaltown, to name a few. But then Niels Alex wanted to do something else and ditched the drums in favour of the guitar and his love for classic hard rock! Together with Jannick, who for a number of years had been writing songs on his own, they built the foundation for a classical hard rock band with clean vocals, lots of heavy guitar riffs, solos and themes – which resulted in the band STATEMENT. 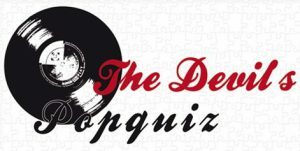 The line-up was completed with bassist Martin Poulsen – from the death/grind band Drab, drummer Peter Thomsen – who has supported Europe and Tesla with his former band Sode, and finally guitarist Jesper Steen Noachsen. Together with Jannick, who for a number of years had been writing songs on his own, they built the foundation for a classical hard rock band with clean vocals, lots of heavy guitar riffs, solos and themes – which resulted in the band STATEMENT. All five members were inspired by classical hard rock/metal acts such as Scorpions, Led Zeppelin, Black Sabbath and Metallica. So even though the majority of the band had been playing extreme metal for about 20 years, they all went back with a new found love for their musical roots and the times of exploration. This is depicted in both the maybe a little naïve, but poetic and touching lyrical universe that surrounds singer Jannick’s youth and deals with the times when drugs, drinking, depressions and a tough party nights in the city, was a great part of his life. In 2014 STATEMENT finished the hard rocking debut album “Monsters”. The album is recorded in Fastbeat Studio, Copenhagen, while vocal recording, mix and mastering is handled by internationally. The Rock n`Roll way. In 2009 Blinding Sparks was born by the ambition of some spirits who are thirsty to express themselves. The post-rock group is composed of five members (Jérémy Conrad on vocals, guitar, keyboards, Johanna Flauder and Océane Thomas on vocals, Nicolas Kieffer on drums and Claude Hilpert on guitar). Beginning with a few compositions and many times, the trend has finally reversed to defend only the “made in” Blinding Sparks. The group tackles themes as vast as life, love, death or despair. His compositions led to two small demos in 2012-2013. They will be a working basis for a larger project: the registration of the Ep “This Useless Fate”. It was born in 2014. As a result of this work, Blinding Sparks finally decides to get in touch with the general public by recording a Maxi Single called “Renaissance Insipidus” which is Blinding Sparks‘ first real record. This album hasd some success, it pushes the group has created a new concept: a bonus disc containing unpublished titles and delusions of the band that will be released each year on the anniversary of “Renaissance Tasteless”. The first of this long series is BS SOLIDERS 1. A new album “Brutal Awakening” is currently in commercial phase since December 8, 2017. Blinding Sparks wants to stand out to establish itself as an innovative and persevering group!